The Estonian Land Forces (Estonian: Maavägi), unofficially referred to as the Estonian Army, is the name of the unified ground forces among the Estonian Defence Forces where it has an offensive military formation role. It is currently also the largest military branch with the average size during the peacetime with around 6,000 soldiers, conscripts and officers. The Maavägi development priorities are the capability to participate in missions outside the national territory and the capability to perform operations to protect the territory of Estonia, also in co-operation with the Allies. 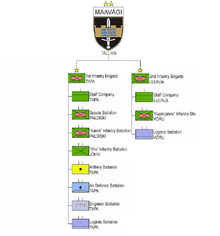 The Maavägi component of the operational structure consists of an infantry brigade and a homeland security structure. Deployable infantry battalion tactical group and some deployable CS, CSS units will developed in the Army structure in accordance with NATO Force Proposals requirements. Infantry brigade will act as a training and support frame for deployable units. Homeland security structure units will have the capability to carry out territorial military tasks and support civil structures. The Land Forces are structured according to the principle of a reserve force which means that the main part of the defence forces of the state are units in a trained reserve. For a state with few human and economic resources, a reserve force based on the will of defence of the citizens is the only viable form of national defence. In peacetime the reservists conduct normal lives and the state takes care of their training and the procurement of equipment and weapons. In wartime the reservists are mobilized into military units. The reserve units are formed on the territorial principle, i.e. conscripts from one area are called up at one time to one unit and after service they are sent to the reserve as one unit. The Estonian Army is always in constant defence readiness in co-operation with the other services. The 1st and 2nd Divisions were created during the Estonian War of Independence, the 2nd Division in December 1918-January 1919. The Scouts Single Infantry Battalion was formed on 21 December 1918. On 21 November 1928 eight 'Single Infantry Battalions' were created. The peacetime purpose of these battalions was to train conscripts. In wartime the battalion would reorganize itself into a regiment with a similar order of battle as the two initial reaction force regiments covering the eastern and southern borders. Each battalion's peacetime strength was a total 237 soldiers, in a regimental staff, a Signal Platoon, an Engineering Platoon, a Ski-Bicycle Platoon, a Building Platoon, and three infantry companies. The wartime order of battle would have transformed the battalion into a regiment size unit carrying the same unit number and would have included 3 infantry battalions, Signal Company, Engineering Company, Ski-Bicycle Company, Cavalry Company, Building Company, Commandant Commando and a CB Commando. In total of 3153 men. 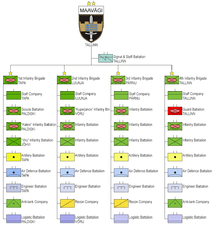 The 2nd Single Infantry Battalion was located at Tartu; the 3rd Single Infantry Battalion was located at Valga; the 4th at Jõhvi; the 5th at Rakvere; the 6th Single Infantry Battalion was located at Pärnu; the 8th Single Infantry Battalion at Valga; the 9th at Pärnu; and the 10th Single Infantry Battalion was located at Tallinn. A reorganisation took place on February 1, 1940 and four divisions were created. The 4th Division staff was based in Viljandi. 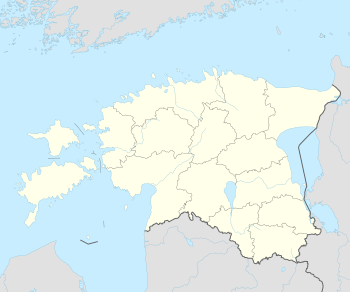 The division was made up by the Pärnu-Viljandi Military District and Valga Military District. The division's last commander was Colonel Jaan Maide. The four divisions were active until the Soviet occupation of Estonia. On August 17, 1940, after Estonia's accession to USSR, the 22nd Territorial Rifle Corps of the Red Army was formed at Tallinn. 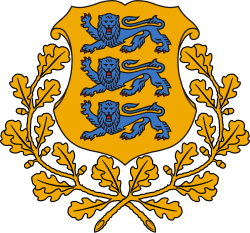 It was created as a territorial Estonian body on the basis of military units and institutions of the Estonian Army. All soldiers and officers kept the Estonian Army 1936 uniforms, on which were sewn Soviet insignia. The first commander of the 22nd Territorial Rifle Corps was a former major general of the Estonian Army, Gustav Jonson, who was later arrested by the NKVD and shot. Initially, most of the corps' officer posts were occupied by former officers of the Estonian army, but by the middle of June 1941 - even before the German invasion of the Soviet Union - most of them were arrested and replaced by newcomers from the Soviet Red Army officers. Many of the Estonian officers of the 22nd Territorial Rifle Corps body were arrested and died in 1941 - 1942 in camps in the Soviet Union; many were shot. The former commander of the 180th Rifle Division, 22nd Corps, Richard Tomberg, survived after dismissal only because since 1942 he has been claimed by the Frunze Military Academy as a teacher. He was arrested in February 1944 (he was released from the camp and rehabilitated in 1956). Some officers of the 22nd Rifle Corps, among whom was Alfons Rebane, managed to escape from the authorities in the period between the dismissal of the army and the plan for their arrest. Someone managed to escape abroad, others came out of hiding only after the arrival of German troops in July - August 1941, some of them volunteered for the Estonian units that fought on the side of Nazi Germany, or to enlist in the Estonian organisations controlled by the German authorities. The 22nd Territorial Rifle Corps was part of the 'operational army' during World War II from 22 June 1941 to 31 August 1941. On June 22, 1941 the corps headquarters was stationed in Rev. 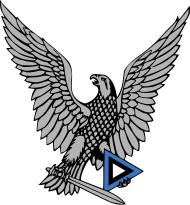 The Estonian Land Forces actively uses seven sizes of military unit: the Lahingpaar (English: Fire and maneuver team), the Salk (English: Fireteam), the Jagu (English: Section), the Rühm (English: Platoon), the Kompanii (English: Company), the Pataljon (English: Battalion), and the Brigaad (English: Brigade). The Diviis or in (English: Division) is not in active use. Tapa Garrison: is also for the HQ Northeastern Defence District and fields the 1st Artillery, Air Defence, and Engineer Battalions. 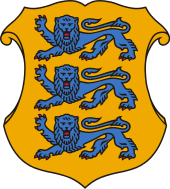 Note 2: Tallinn is HQ Northern Defence District, HQ Estonian Navy, and garrison for the Guard Battalion. 2 infantry brigades, one of them mechanized. Currently there are two professional infantry battalions (Scouts Battalion and the Kalev Battalion) in ground forces. There is also a Estonian Special Operations Force. Although the defence force employs various individual weapons to provide light firepower at short ranges, the standard weapons used by the ground force are the domestically upgraded variants of the 7.62mm AK4 and 5.56mm Galil-AR assault rifles, as well as the 9mm variant of the MP5 submachine gun for special operations force. The primary sidearms are the 9mm PM and USP semi-automatic pistols. Some units are supplemented with a variety of specialized weapons, including the Galil-ARM and Negev light machine gun, to provide suppressive fire at the fire-team level. Indirect fire is provided by the M-69 and CG M3 grenade launchers. The 18.53mm Benelli-M3T dual-mode shotgun is used for door breaching and close-quarters combat. The domestically produced modification of the 7.62mm M14 selective fire automatic rifle TP2 and Galil-S are used by the snipers, along with the 8.6mm Sako TRG and 12.7mm Hecate II heavy sniper rifles are used long-range marksmen. Hand grenades, fragmentation and smoke grenades along with the grenade launcher systems, such as the HK-GLM and HK-79N, are also used. The defence force also employs various crew-served weapons to provide medium and heavy firepower at ranges exceeding that of individual weapons. The 7.62mm MG-3 and KSP-58 are the ground force standard medium machine guns. The 12.7mm Browning M2HB heavy machine gun is generally used as a vehicle-mounted machine gun used by motorised infantry. The ground force uses two types of mortar for indirect fire support when heavier artillery may not be appropriate or available. The smallest of these are the 81mm M252, B455 and L16A1 mortars that normally assigned at the infantry company level. At higher echelon, infantry battalions are supported by a section of 120mm M-41D and 2B11 mortars, which are usually employed by motorized units. Fire support for infantry units is provided by towed howitzers, including the lighter 122mm D-30H63 and heavier 155mm FH-70 field howitzers. The ground force utilizes a variety of shoulder fired missiles, recoilless rifles and anti-tank guided missiles to provide infantry and mechanized units with an anti-armor capability. The 82mm B-300 is a reusable man-portable anti-tank shoulder-fired missile system. The 84mm AT4 is an unguided projectile that can destroy armor and bunkers at ranges up to 500 meters. The 90mm C90-CR is a disposable, shoulder-fired and one-man operated grenade launcher. Some motorized units are supported by the Pvpj 1110 and M40-A1 recoilless rifles that are mounted on high-mobility utility vehicles. The 115mm MILAN-2 with the night-firing ability and 148mm MAPATS laser-beam riding anti-tank guided missiles are the ground forces main anti-tank weapon systems. The purchase of the 127mm FGM-148 Javelin fire-and-forget anti-tank missiles will increase the ground forces anti-armor units capabilities. The 90mm Mistral is an infrared homing surface-to-air missile, which along with the 23mm ZU-23-2 twin-barreled anti-aircraft cannons mounted on trucks make up the backbone of the defence forces air defence. The ground force currently does not operate any main battle tanks although some types were in service of the ground force till the Soviet occupation in 1940. In recent years the Estonian MoD has indicated a need to obtain main battle tanks by 2020 according to the national defense development plan. As 2014, the infantry fighting vehicle CV9035 is the ground force's main battle and front troop carrier vehicle which is fitted with a 35mm autocannon turret and carries up to 8 fully equipped soldiers. The ground force's most common armoured vehicles are the Pasi series armoured personnel carriers of which some have been fitted into ambulance and command post vehicles roles. The Pasi 180 and Pasi 188 armoured personnel carriers which are the standard troop carrier vehicles of the ground force and have also been used by the defence forces expeditionary units on peacekeeping operations in Central Asia and Africa. In recent years BTR-80 amphibious armoured personnel carriers have been used as training vehicles and are now being phased out. Although the ground force currently does not operate any self-propelled howitzers or multiple launch rocket systems the Estonian MoD has also indicated a need to obtain self-propelled howitzers for the 1st Infantry Brigade which will be transformed into a mechanized brigade. While the ground force does not have any utility helicopters, attack helicopters or aircraft of its own, it does operate several types of unmanned aerial vehicles and rotorcrafts. Currently there are no operational armed drones in service of the ground force. In 2014, the Estonian MoD announced that Estonia, along with 12 other NATO members, plans to purchase Global Hawk drone to increase its military reconnaissance capabilities. The defence force's most common vehicles are the Unimog and DAF series general-purpose trucks and light utility vehicles such as Unimog 416, Unimog 435, DAF YA4440 and MB 250GD. There are also variety of different MAN and Sisu built military logistics vehicles, such as MAN 4520, 4620, 4640, KAT1 and Sisu E13TP, in use of the ground force, which are capable of serving as a cargo/troop carrier, artillery tractors, weapons platform and ambulance, among other roles. The ESTDCU, is the Estonian version of the digital camouflage uniform and its various patterns are designed for use in woodland, desert, urban and winter warfare environments. Soldiers of Estonian Ground Force also get the PASGT combat helmet and ballistic vest and a night vision device. Based on a long-term defense development plan, the Land Forces are currently undergoing a modernization program. By the year 2018 the Land Forces are likely to be equipped with modern infantry fighting vehicles, along with the additional armored personnel carriers. The artillery capabilities were greatly increased in 2008 with the purchase of 122mm field howitzers from Finland. The Land Forces are also planning to create tactical air surveillance. 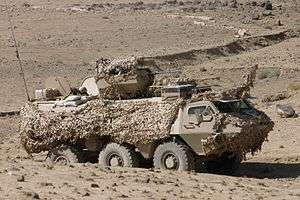 An Estonian XA-180 in Afghanistan. 44 CV9035NL. Former Netherlands Army on order, first delivery in 2016, projected to continue until 2018. 35 additional Norwegian CV90s on order. ↑ Light arms of the Estonian Ground Force Journal "Kaitse Kodu", Vol. 6, 2009. ↑ Military equipment of the Estonian Ground Force: individual and crew served weapons. Kaitseväe Võru Lahingukool, Sõduri Käsiraamat, Võru, 2013. ↑ "Eesti saab USA-lt 80 uut miinipildujat" (in Estonian). Postimees. 1 2 3 4 5 "Estonian Defence Forces equipment". United Nations. ↑ "Kaitseministeerium hankis Soomest õhutõrjerelvastust". Estonian MoD. ↑ Eesti hakkab üles ehitama tankiväge, Forte: Delfi, 2010. ↑ Defense Ministry Proposes to Purchase 44 Combat Vehicles, Estonian Public Broadcasting Service, 2014. ↑ Kaitsevägi võtab Aafrika missioonile kaasa neli soomukit, Postimees, 2014. ↑ Lääne maleva kaitseliitlane taastas vana soomuki, Postimees, 2014. ↑ Military's New Development Plan Receives Government Approval, Estonian Public Broadcasting Service, 2013. ↑ Eesti õhuruumis hakkavad lendama droonid, Reporter, 2014. ↑ Estonia plans to purchase Global Hawk drone to increase its military reconnaissance capabilities., Defence & Security News - Estonia, 2014. ↑ Kaitseväe varustus, Riigikogu, 2007. ↑ Larrinaga, de, Nicholas (10 October 2016). "Estonia receives first CV90 IFVs". IHS Jane's 360. Retrieved 10 October 2016. ↑ Tomkins, Richard. "Norway selling CV90 vehicle hulls to Estonia". United Press International. Retrieved 13 January 2016.